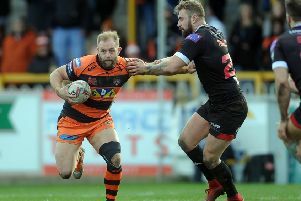 Castleford Tigers boss Daryl Powell has called on his team to show their durability as they head into a hugely testing period when they will play a number of the top teams in Super League. After Saturday’s game at Hull the Tigers then play St Helens twice in league and cup matches and take on Leeds Rhinos at Magic Weekend with Powell admitting his players will have to be firing on all cylinders if they are to come out of the month with success. He told the Express: “It’s a very tough run of matches we’re in now. They don’t come any tougher than St Helens, they’re the best team in the comp at the moment and we’ve got them twice in the next block of games. “We are going to need to have a real toughness and durability about us. “We’re going to need to defend well and our kicking game is going to need to be outstanding. Also we’ll need to take our chances. Powell added: “You look at us from a half-back perspective and we’re a little bit different. “Jamie Ellis is obviously a genuine half-back, but Macca doesn’t play there too often so we’ll have to find different ways of playing and performing.